I was lucky enough to meet some more of my extended family in New York. They very kindly took me to Elis island for the day. We drove through the busy, bustling lively Manhattan to Battery Park, where we boarded a great, big, busy ferry. It took us across the scenic Hudson River, passing the grand statue of liberty, given to America by France as a gift in 1886. 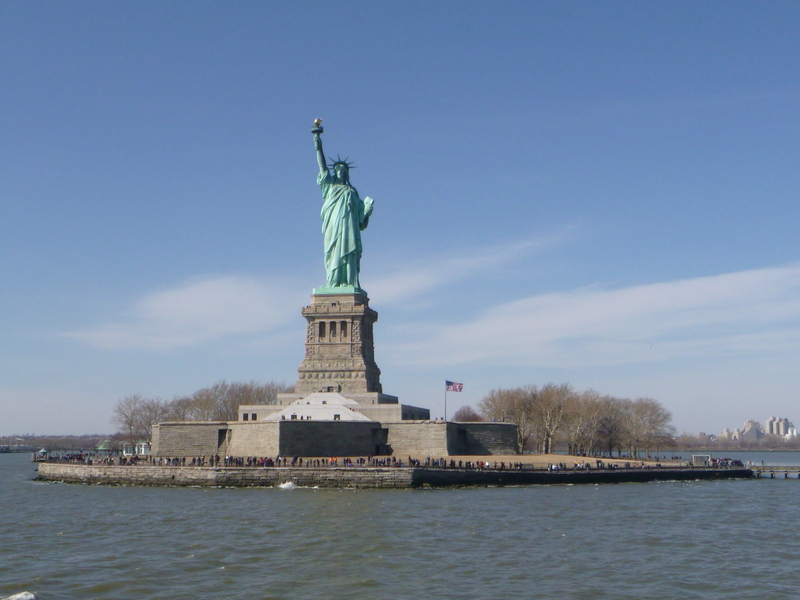 It is a symbol of freedom and was the first thing immigrants saw as the y ebter d America. The symbolic statue of a women holding a flame torch, with her leg chained to the ground, gave so many hope. Getting away from the fast paced and somewhat hectic New York I was able to appreciate the dramatic skyline in the distance. Tall, elegant building jutted out into the clear blue sky, hiding any sort of horizon there may be. Their perfect architecture of these oblong objects allowed them to house so many businesses, offices and homes. Hundreds and thousands of perfectly rectangular windows glimmered as the sun shone on them. Huge, stable, impressive bridges connected regions enabeling one to journey across in minutes. While, these structures looked phenomenal, served important purposes and facilitated travel, they are also an indicator anthropomorphic manipulation. They represent capitalism, overuse of resources and how we have heavily changed the landscape. I have to say while, I appreciate these cityscapes they also make me appreciate the quiet, stunning and natural landscapes our planet still has – places were you can sit still and enjoy your surroundings. Nonetheless, New York is a great city full of fascinating artefacts. On reaching Elis island we explored the island’s museum. It was very interesting. In 1900-1924 those hoping to seek citizenship in the US, were required to travel by ship to Elis island. After incredibly unpleasant voyages, those that survived the hardship, waited in a humongous Hall waiting for approval to be exepted into the country. If they were not they had to return and endure another horrific ship journey. Today, to get visas and citizenship in America is harder you have to apply through extensive processes online and with embassys. Next, it was time to return we boarded back into the boat and enjoyed another pleasant ride to Battery Park. 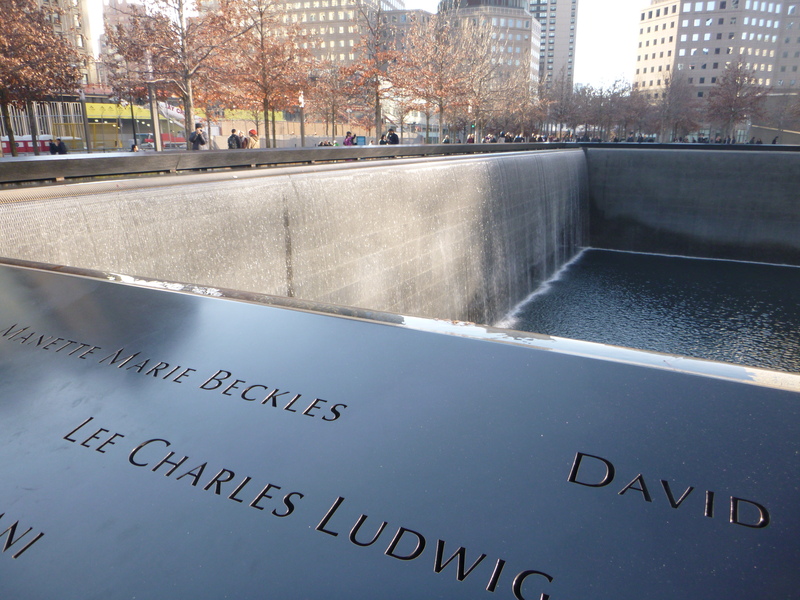 We stopped off at the world trade water fountain memorial. All names of those killed were inscribed along it. The piece was very moving. It was then time to meet more family. We all went to a kosher restaurant in the heart of New York. It was great to meet more family members and I loved hearing stories about my late grandfather – it was very touching. I am so pleased to have met and spent time with its all this family while exploring New York.